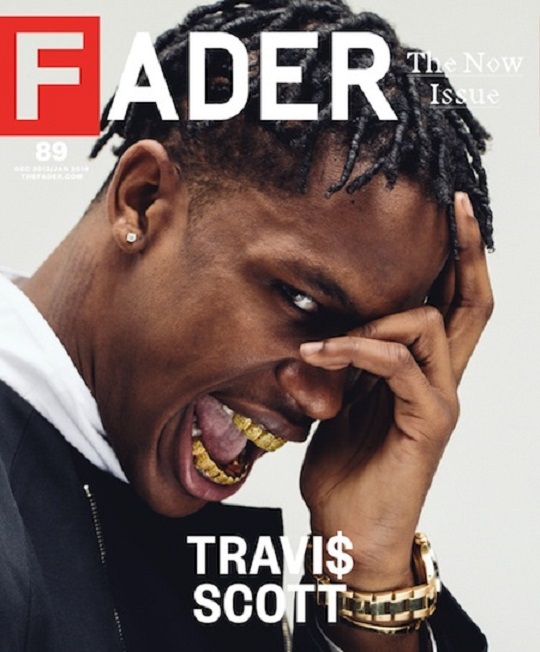 Travi$ Scott lands his first cover with FADER magazine. The rapper-producer will be gracing the FADER’s 2013-2014 Now Issue which is due to hit shelves on December 10. The artwork showcases Scott posing in front of a white backdrop as he covers up half his face and shows off his gold grill. FADER also includes a behind the scenes visual recap of Scott’s photo shoot which follows the artist as he decides on what to wear with stylist, Mobolaji Dawodu, and works to get the perfect picture with Jonathan Mannion. This entry was posted in Artwork, Miscallenous, Video and tagged artwork, behind the scenes, FADER, magazine, photo, travi$ scott. Bookmark the permalink.